So September has come and the days are suddenly a little cooler. Summer is gone – what we had of it. But between the rains of June and July and the collective moment of forgetting everyone took through the Olympics and Paralympics, there were some occasional sunny, warm days. Summer did happen. We have the evidence here in the shape of some pictures of a back garden barbecue. But what do you cook for a vegetarian at a barbecue? Nothing? C’mon! Buy some frozen veggie burgers and heat them through? Ugh. Make them a salad? What, to soak up the beer and wine? Don’t invite them? Jeez. It’s a shame that more people don’t realise how much can cooked on a barbecue. Grilling vegetables, fruit and even cheese is simple – much easier than cooking meat, from what I gather from watching others – and is pretty much a surefire way of welcoming non carnivores to the party. My theory is that a barbecue involves two things: smoke and good quality ingredients – ones that you’d enjoy eating if they were cooked in another way. Simple. 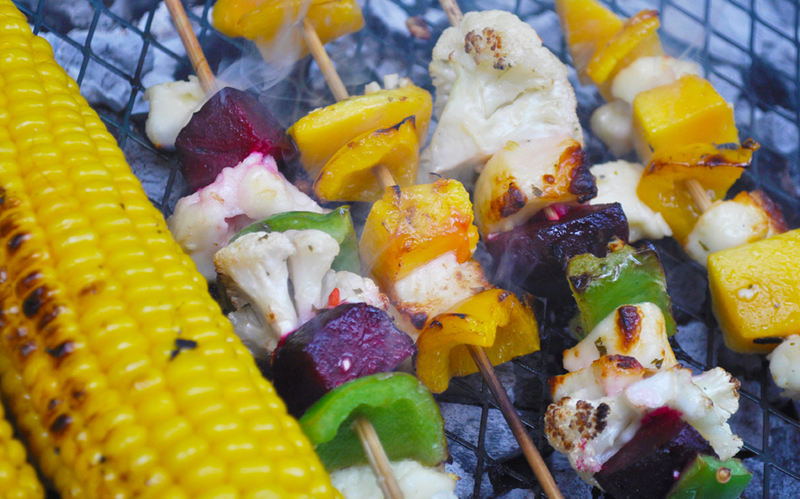 For us at ETP Towers, that means grilling skewers of mixed vegetables over charcoal. Try florets of cauliflower, peppers, cherry tomatoes, artichoke and beetroot. Mix the veg with cubes of halloumi and fruit – my favourite, mango, or even a strawberry. We also grill flat mushrooms, strips of aubergine and courgette and, of course, corn on the cob, par-boiled for a few minutes first. For a marinade we often use a mix of olive oil, lemon juice, garlic and a herb – thyme maybe, or rosemary – and chilli maybe, too. 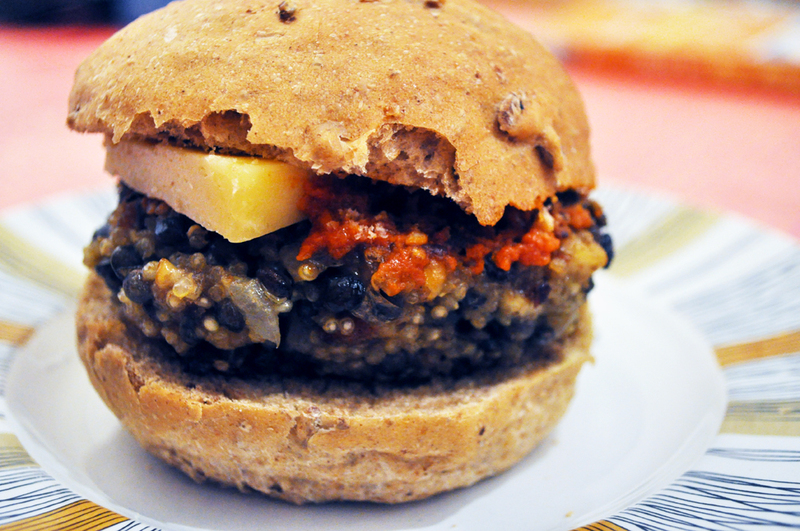 Ella’s fab veggie burgers, here, would also go down a treat. 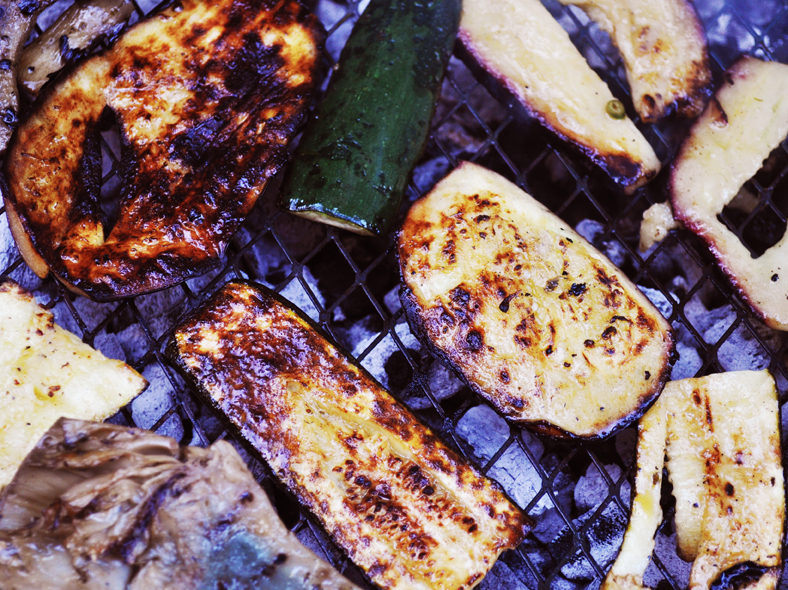 There are more spectacular things to barbecue – aubergine rolls with all kinds of fillings, chilli polenta slices, for example – but some of the above is so easy, so quick, that the question of what to feed a vegetarian at a barbecue should never need be asked again. Warm salads are the perfect choice for months when the seasons are changing. Maybe it’s the ability to take some veg from one season and lighten it up, or load it down, with some from the next. 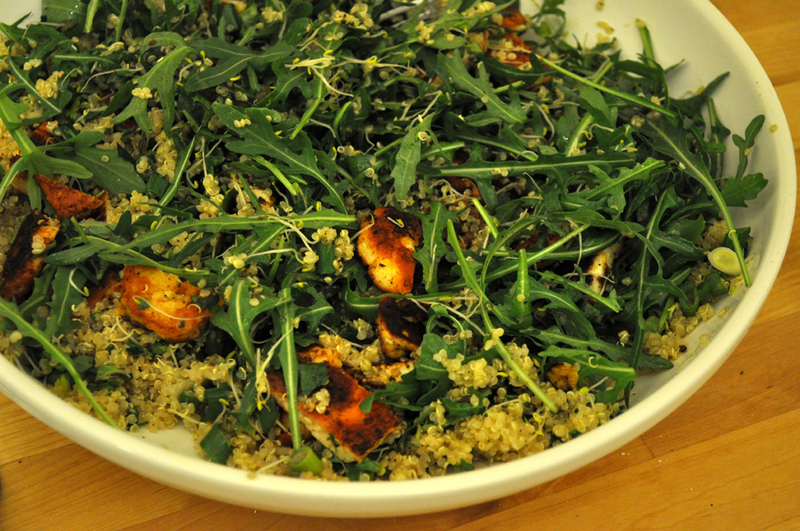 This salad – I say salad, though it’s almost a stew, is a Denis Cotter recipe from For the Love of Food – a book we’ve used a few times in this blog. See it here, it’s great. Oh, and go and visit Denis’s restaurant in Cork – it won’t let you down. Have a look, here. So, I won’t give the recipe in full but, basically… the slices of halloumi are marinated briefly in chillis, cumin and lime zest; the beetroot roasted, with a sprinkle of olive oil and balsamic vinegar; the lentils cooked with sprigs of thyme and garlic; serve with lentils on a bed of spinach with the halloumi on top. And can you spot our variation? 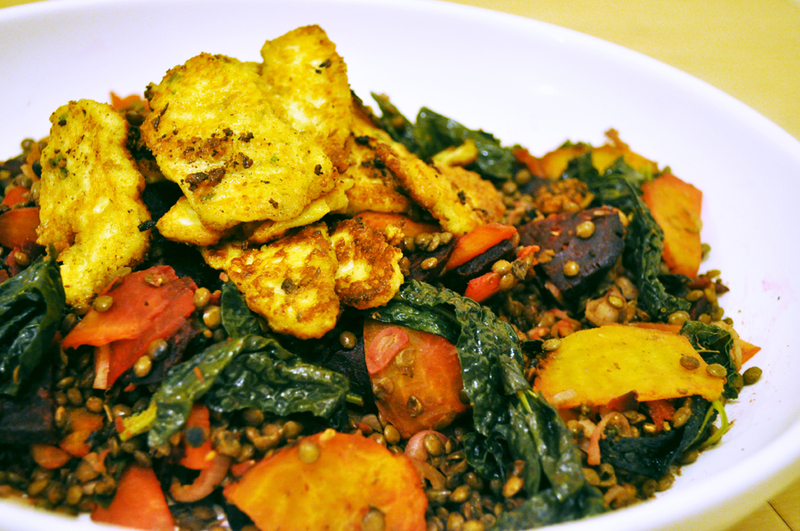 Yep, we had no spinach so we steamed some greens and ran them through the lentils. Twas fine indeed. As I type this the wind is rattling the windows and the skies are a deep grey – a kind that Elle Deco would probably say is very fashionable for an accent wall right now. Yes, the sky is all rather Farrow and Ball. It was a lovely evening when I made this soup, however. Ella was late coming home and I was pottering about after a day’s work. 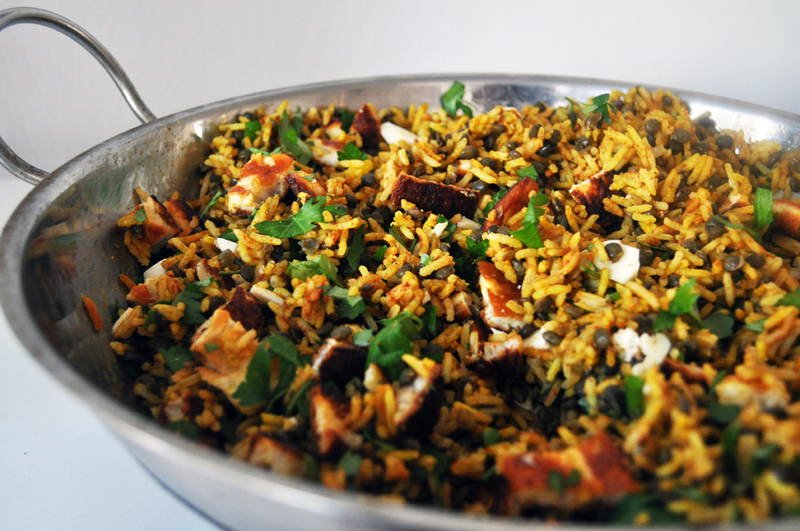 The recipe, here, is by Yotam Ottolenghi and would also make a fab lunch – perhaps with a light glass of Vinho Verde. I made rather a lot of croutons, as you can see. But I do like halloumi! And I know, fennel, chilled, soup? 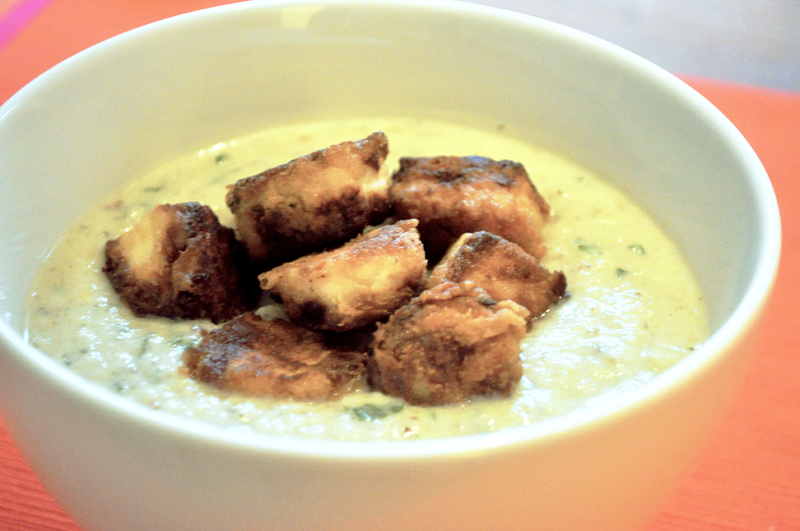 Give it a go – especially if you’re fond of a hearty gazpacho or almond based ajo blanco.